With offices all over Europe and distributors on all continents, HQ strives to provide the best in the market through its distribution network. The company always offers the best value for money. HQ Cable, SCART/m - SCART/m, 1.5 m HQ Cable SCART/m to SCART/m with length 1.5 m.
Cable Displayport/m-DVI/m 25 pins, 3m gold plated plugs Displayport 19 pin male to DVI-D 24+1 pin male monitor cable with ferrite cores. Car audio cables kit, CAT-KIT11 Car audio cable kit 800 W.
Magnifying table lamp, 12W, black, magnification x1.75 and x4 Lightweight and small magnifier table lamp. The unit has a powerful 3+12 diopter 10 cm glass lens and is ideal for up close work which needs an eye for detail. The lamp comes with an energy efficient compact 12 W fluorescent bulb. List Price 59.90лв. VAT Incl. 56.90лв. VAT Incl. 53.91лв. VAT Incl. Megaphone HQ10W Megaphone HQ10W with recording function. Cable, VGA/m-VGA/m, 3 m Cable, VGA male - VGA male, 3 m, series HQ Basic, double layer shield. HQ Cable, DVI/m-3xRCA/m RGB, 2.5 m Cable DVI/m to 3xRCA/m RGB with length 2.5 m, High Quality Silver series. Cable, plug 3.5 stereo/m-plug 3.5 stereo/m, 0.75m Audio cable, jack 3.5 stereo/m to jack 3.5 stereo/m, 0.75m for transfer of audio signals. 10m HDMI cable High quality and high speed HDMI male to HDMI male cable with gold plated connectors, 10 m long. 10m HDMI Cable High quality HDMI male to HDMI male cable, 10 m long. Cable HDMI/M-HDMI/M, black, 15m High-quality HDMI cable (male-male) with a length 15 m, gilded tips and support for 4K resolution and 3D. Cable HDMI/M - HDMI/M, black, 20m High quality HDMI male to HDMI male cable, 20 m long. 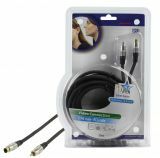 Cable, 2xRCA/m-2xRCA/m, 2.5m HQ Series Cable extension 2 x RCA / m to 2 x RCA / m, for AV and Hi-Fi equipment and components, 2.5 m long. High quality product from the HQ series. Cable HDMI/M - HDMI/M, black, 5m High speed HDMI male to HDMI male cable, 5 m long. List Price 29.00лв. VAT Incl. 27.54лв. VAT Incl. 26.09лв. VAT Incl. 24.63лв. VAT Incl. 1.5m HDMI to micro HDMI Cable HDMI male to micro HDMI male cable, 1.5 m long, with gold plated connectors.